← Show Me The Funny! Weird Al Visits The Nite Show! Happy Writer’s Day, Modern Philosophers! 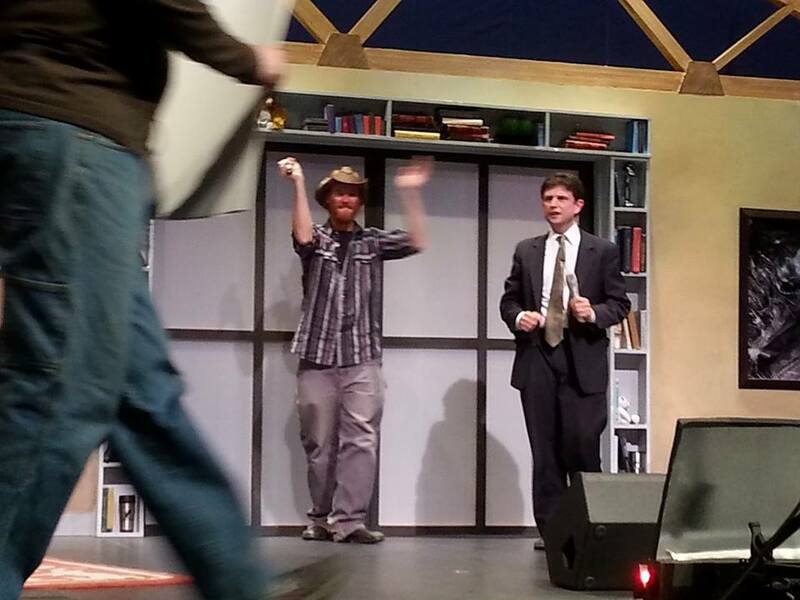 Last night’s taping of The Nite Show With Danny Cashman was utterly epic. So much so that I didn’t even have the energy to write about it when I returned to The House on the Hill. 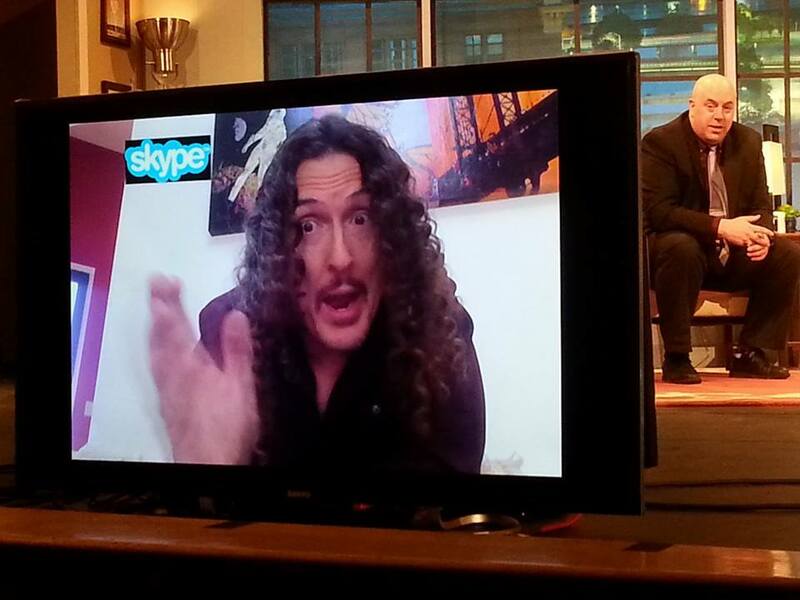 As you can see from the photo, Weird Al Yankovic visited the show via Skype! Danny had spent the week on social media teasing a very special cameo during the taping. I chose not to pester him about it because I wanted to be just as surprised as the rest of the audience when the guest was revealed. Let me set it up for you. Luke Mallett of The Mallett Brothers Band was Danny’s first guest. They got to talking about how Jimmy Fallon and Justin Timberlake do their History of Rap bits on The Tonight Show. Next thing you know, Danny and Luke are at center stage doing a duet of Weird Al’s songs. How could you not love that? The audience was totally into it, clapping along with the singing. Luke’s singing was very good. Danny might want to stick to being the host and leave the singing to the musical guests. It didn’t matter how off tune Danny was because everyone loves Weird Al’s songs. However, they did particularly butcher Amish Paradise. That was when the familiar Skype ring filled The Gracie Theatre. The next thing we knew, Weird Al himself was on the monitors critiquing Luke and Danny. Weird Al. On The Nite Show. Of course, Weird Al had to show the guys how it was done. So, he launched into Amish Paradise. Now the crowd was really going wild, clapping along, and taking pictures of Weird Al as he serenaded us from the monitors. 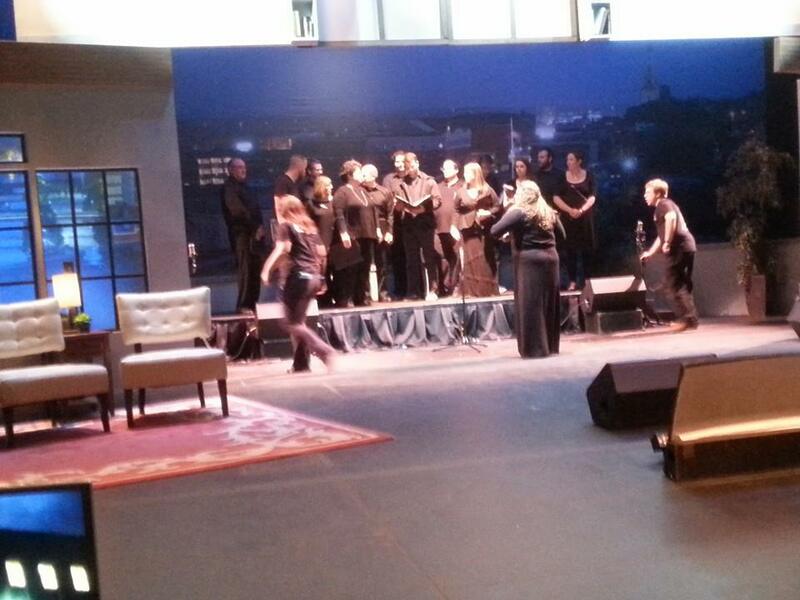 The backdrop raised to reveal a choir, and they sang background vocals to Weird Al’s lead. It was awesome! I know I’m geeking out a bit here, Modern Philosophers, but I love Weird Al, and the fact that he would appear on our late night show in Maine proved that he is a great guy. And how about Luke Mallett? The Mallett Brothers Band is probably the most popular group in Maine, and he’s up there on stage in an Amish hat, covering a Weird Al classic. 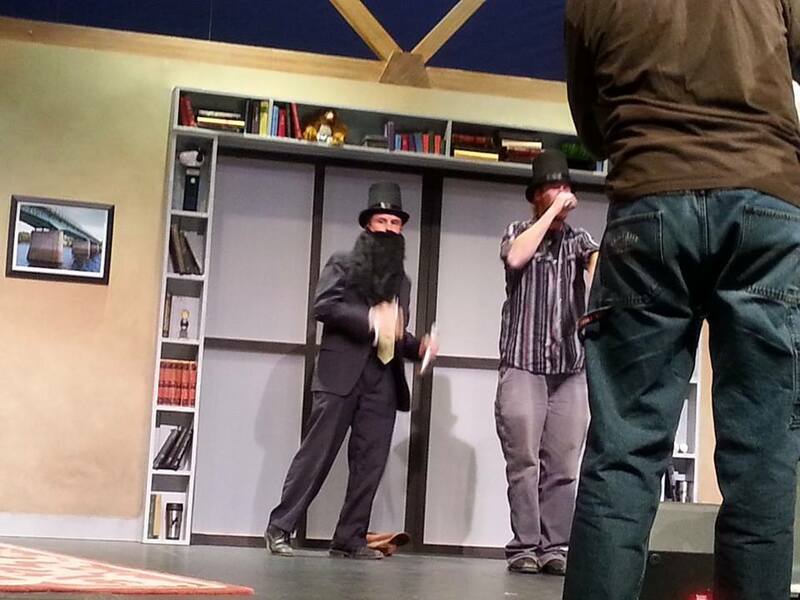 Did you ever wonder what Danny might look like in an Amish hat and beard? Well, wonder no more, Modern Philosophers! This is the kind of entertainment The Nite Show brings to the people of Maine on a regular basis. Do you now understand why I enjoy working on the show so much? To top off the night for me, Danny used the time travel joke I wrote! As you might recall, when I appeared on the show two weeks ago, I talked about how I keep peppering Danny with jokes about Zombies, time travel, and Star Wars and then wait to see how long it takes for him to crack and finally use one. Success! I slipped one time travel joke and one Star Wars joke into my batches (I couldn’t find a good way to work in the Zombies this time! ), and one came out a winner. Don’t worry, I’ll share the Star Wars joke in an upcoming Sunday Rejects posts. Sounds like a great night, right? Believe it or not, it ended up getting even better on a personal note, Modern Philosophers, but I don’t want to say anything yet out of fear of jinxing it. This entry was posted in Humor, Philosophy, Writing and tagged Amish Paradise, Danny Cashman, Humor, Luke Mallett, Modern Philosopher, Sarcasm, satire, The Mallett Brothers, The Nite Show, Time Travel, Weird Al Yankovic. Bookmark the permalink. 28 Responses to Weird Al Visits The Nite Show! Shut up! What’s her name? That sounds like an epic evening alright. I can’t wait for the joke. That is AWESOME!!! I am so jealous – in a good way, of course! It was very cool. I was geeking out! Maybe Danny will share the clip on YouTube once it has aired! I love the Weird Al Yankovic parody videos! Have you got a mop I can borrow? Thank you, that’s very kind of them! Awesome! I actually just wrote a tribute to Weird Al yesterday. He’s maybe my favorite singer ever. So I can’t imagine what happened that was even better than that. That sounds pretty epic. I grew up on Weird Al and he made me realize you can make anything your own with a little imagination. Can’t wait to hear more. It was really cool. 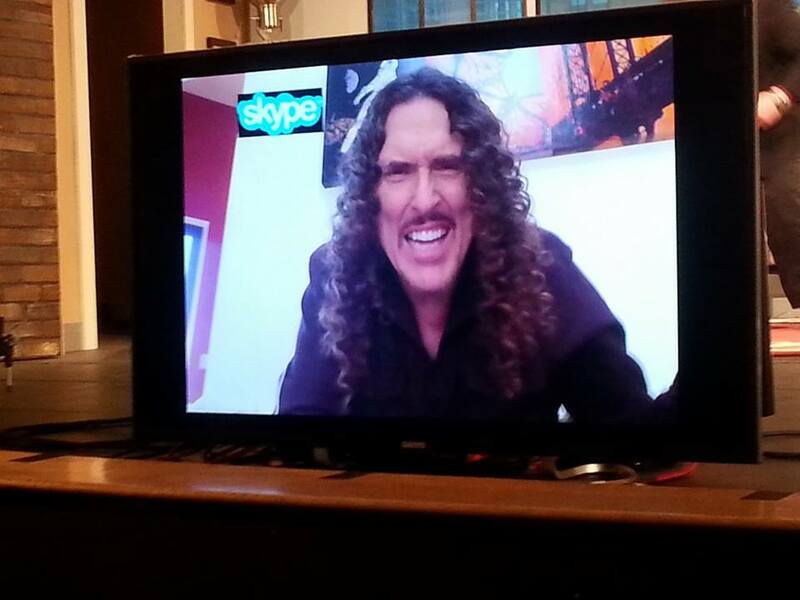 We don’t really get many bigger name stars up here in Maine, so for Weird Al to do the Skype thing was awesome. Weird Al was a peach to appear via Skype, Austin. Sounds like a winner of a show. I can’t wait to hear your even bigger news. No jinxing. Knock on wood! I ADORE Weird Al and have since the ’80s. But having one of your time travel jokes used is what truly made the evening epic. So there is still something to aspire to.